Toyota Manufacturing UK (TMUK) has reach its target of raising £1-million for the NSPCC, money which has been put to good use in projects supporting children in the regions around its factories in Derbyshire and North Wales. charity in 2006, raising money through company and employee fund-raising initiatives. Since 2008, donations have been made by the Toyota Manufacturing UK Charitable Trust, taking the total raised so far to £1,015,286. Toyota's contribution has helped the NSPCC Schools Service reach more than 15,000 primary school children in Derbyshire and, since 2013, more than 1,650 in Flintshire. The money has helped the service meet its target of reaching 1.7-million children across the UK with advice and information on understanding abuse, giving them confidence and courage to speak out and seek help should they ever need it. TMUK celebrated the efforts of its workforce in reaching the charity milestone with a children's tea party-themed event attended by school children and ChildLine volunteers local to its Burnaston plant in Derbyshire. 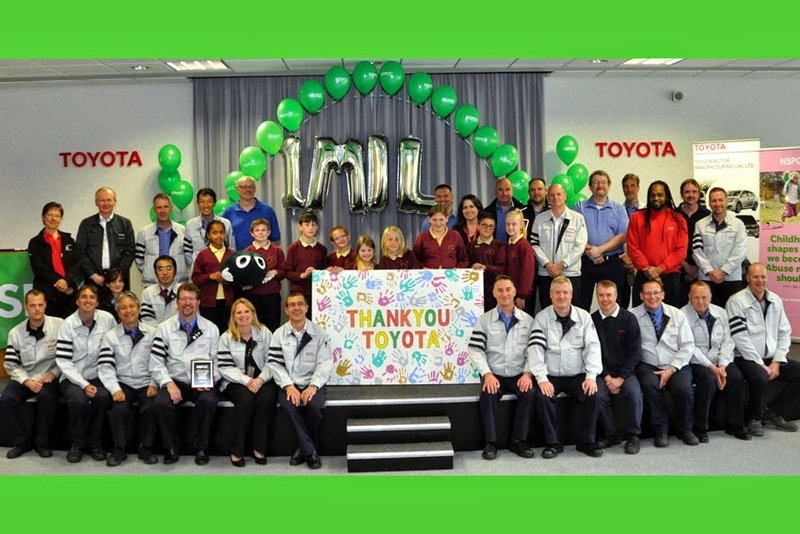 "On behalf of the NSPCC, I'd like to thank the inspiring team at Toyota for their incredible support, which enables to make a real difference to the lives of local children. Like us, Toyota believes every childhood is worth fighting for. Their support will help us protect a generation of local children," said Peter Wanless, Chief Executive, NSPCC. Tony Walker, a trustee of the charitable trust, added, "The NSPCC does fantastic work to stop cruelty to children and making a real different to the lives of vulnerable young people in our local communities. It is with great pleasure that we are able to celebrate the result of nine years of fund-raising by TMUK members - the donation of more than £1-million to the NSPCC."